Jens Soering is saying he didn't murder anyone, but he isn't asking to be cleared of any charges. Parole and deportation back to Germany is his request after he was dealt two life sentences for a 1985 double murder. He wants to go home and is taking his case to the governor. For a quarter of a century Jens Soering has been fighting for his freedom, to leave his current home at the Buckingham Correctional Center and return to Germany. Soering, the convicted killer said, "Locking up the wrong man for 25 years is a terrible, terrible thing to do." In one of his first television interviews in recent years, Soering asked Governor Bob McDonnell to recommend his parole and deportation. The former University of Virginia Jefferson Scholar is serving two life sentences for a double murder in Bedford County in 1985. However, Soering says he took the wrap for a crime his girlfriend committed. "This is my fault. I should have told the truth," said Soering. His attorney has sent a letter to McDonnell asking him to consider a petition that cites DNA tests that eliminate Soering as a contributor in dozens of samples retained before that type of testing was used. Soering added, "I know I didn't commit this crime and I don't need anybody to tell me that." Former Governor Tim Kaine ordered Soering's release before he left office in 2010, but McDonnell revoked that order. Now, Soering's message to McDonnell is simple, accepting responsibility is a two way street. "The commonwealth of Virginia needs to step up and accept responsibility for what its done to me," asserted Soering. The governor's spokesperson released a statement which stated, "We are reviewing this petition. Jens Soering was found guilty of the brutal murder of two innocent Virginians. The governor is committed to ensuring justice is served in this and all cases in the commonwealth." 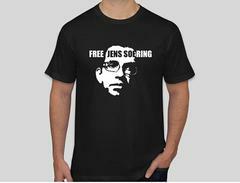 If transferred to Germany, Soering would be eligible for release after two years.